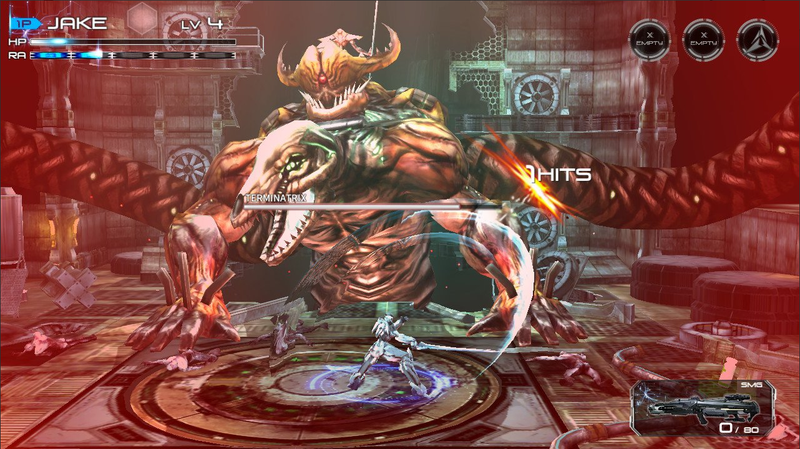 Originally released in 2015 as a mobile game, Implosion: Never Lose Hope is a futuristic hack and slash title now available on the Switch. It’s awkward to play, but it’s full of old school charm. Implosion follows the story of a mech pilot named Jake as he battles virus ridden zombies after an apocalyptic event on Earth. It merges Diablo’s dungeon crawling with Zone of the Ender’s flashy mech combat, but together these elements feel at odds with each other. The beat ‘em up action always feels a bit too stiff coming from a sleek robotic warframe. Understated sound design and meager controller vibration during attacks makes your giant robot feel more like a child fending off bullies than deft maneuvers from an ace pilot. For a game focused on providing the kinetic experience of slashing through hordes of enemies, Implosion falters when it comes to actually delivering. Despite its weak sound, Implosion is visually strong, marrying an array of looks from the past. Large mutant bosses and waves of fleshy zombie enemies feel like they stepped right out of a canceled Playstation 2 Contra titles. The UI emulates the presentation of Vanquish, giving the sense of being in a mech suit without completely veering into straight-faced simulation. The end result is a game that feels self consciously B-list, as though it were a lost Dreamcast title surreptitiously ported to the Switch. Playing Implosion feels like cracking open a time capsule. It takes two steps backward to a time when camp was king and style trumped substance. The end result is pulpy and endearing, a game that feels out of place today but presses onwards in spite of its flaws. I don’t think Implosion is a good game, but I can’t deny that it is an earnest one.